I am watching the Samurai TV version of this match, as if I watch another full Stardom rookie match I will literally die. Plus I like the replays. All the wrestlers above have profiles on Joshi City, you can click on their names to go straight to it. Onto the fun! As long a the sun rises in the East, we will begin Stardom shows with rookies and youngsters. This show is no different, as Hiromi Mimura and Konami join the rookies and children in battle. I continue to be sad that Konami hasn’t found a real place in Stardom yet, she is much better than this, but it is what it is. Hanan is the best child on the roster but all have shown flashes of ability and could turn into real stars if they continue wrestling the next few years. Shiki and Hiromi start the match, dropkick by Shiki but Hiromi hits an armdrag and puts Shiki in a stretch hold. Shiki’s friends run in to help and triple team Shiki in the corner, they put Hiromi into the ropes to attack her some more but she manages to tag in Konami. Shiki teams in Hanan and Hanan gets all three of her opponents to the mat, standing moonsault by Starlight Kid and she hits Konami with a Tiger Feint Kick. Konami gets Hanan to the mat and goes for a triangle choke, but it is quickly broken up. Hanan tags in Starlight Kid but Konami kicks her in the head, cover by Konami but it gets two. Konami hits a vertical suplex and tags in Ruaka, Ruaka boots Starlight Kid in the corner and boots her in the chest for a two count. Ruaka picks up Starlight Kid but the fisherman suplex is blocked and Ruaka hits a reverse STO. Hiromi comes in and dropkicks Starlight Kid, Ruaka comes in and she hits a fisherman suplex hold onto Starlight Kid for two. Ruaka picks up Starlight Kid but Starlight Kid rolls her up for two, dropkick by Starlight Kid and Shiki hits a missile dropkick. Standing moonsault by Starlight Kid on Ruaka, but Ruaka barely gets a shoulder up. Cyclone suplex by Starlight Kid, Konami and Hiromi come in but they quickly get cleared out. Starlight Kid goes up top and nails the Frog Splash on Ruaka, and she picks up the three count! 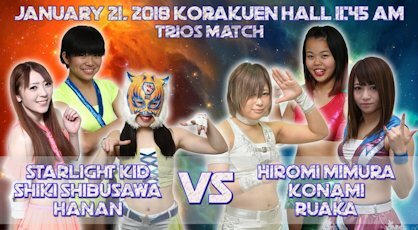 Hanan, Shiki Shibusawa, and Starlight Kid win! They did as well as could be expected, as they kept the speed up with very limited downtime/silliness (except when Hiromi Mimura was around). Not as much was clipped as I was expecting but what they showed was perfectly fine. I’ll give Konami much of the credit since she by far was the best person in this match, but everyone played their roles well. Not bad for an opener. Team Jungle vs. World Selection! Since Kyona didn’t wrestle with her own faction on the last show, I am glad she is back where she belongs. The World Selection team is an interesting mixture, as Miranda has the least amount of experienced as she debuted in 2016, while Savoy is the current SHIMMER Champion and one of the top female wrestlers on the American indie scene. Xia is only 18 but has been wrestling since mid-2015, she has improved dramatically since her first tour with Stardom last summer. Team Jungle attacks before the bell rings, Xia is isolated in the ring until Savoy runs in to help even the odds. Savoy slams Natsuko before suplexing Kaori onto her, she then grabs Miranda and tosses her onto Natsuko for extra measure. Xia and Kaori stay in as the legal wrestlers, chop to the throat by Kaori and she connects with the running senton. Kaori tags in Natsuko but Xia drops her with a headscissors, knee by Xia in the corner and she slams Natsuko’s face into the mat. Dropkick by Xia, and she covers Natsuko for two. Xia tags in Savoy, butterfly suplex by Savoy and she hits a gutwrench suplex onto Natsuko. Natsuko quickly rolls up Savoy but it only gets a two, Savoy boots Natsuko but Natsuko hits a running shoulder tackle in the corner. She goes for the spear but Savoy catches her and hits a suplex, Savoy picks up Natsuko but Natsuko hits a back bodydrop. Spear by Natsuko and she makes the hot tag to Kyona, Kyona shoulderblocks Savoy and goes up to the second turnbuckle, but Savoy avoids the bodypress. Sliding Kick by Savoy, but Kyona kicks out of the cover. Knees by Savoy to the midsection and she delivers a backdrop suplex, Savoy tags in Miranda while Xia comes in as well. Kyona is triple teamed, ending with a satellite roll-up by Miranda of sorts for a two count. Miranda picks up Kyona and hits an enzuigiri, cutter by Miranda but Kyona barely kicks out of the cover. Miranda picks up Kyona but Kyona levels her with a lariat, Savoy and Xia come in but so does Natsuko and she spears both of them. 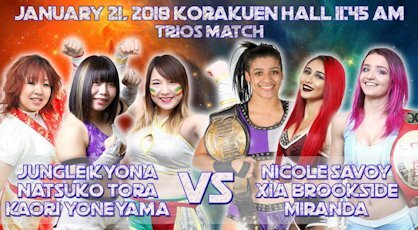 Kaori comes in as Miranda is now isolated, Hammerthrow Powerbomb by Kyona on Miranda and she picks up the three count! Team Jungle are the winners. Just a short fun midcard match. I will say that Xia was really fired up and Savoy looked good with her suplexes. No surprise that Team Jungle won, no reason for them not to since Miranda is basically in Stardom for this tour to eat pins. Not long enough to get excited about but fine for what it was. Apache still having the title is quite a surprise, considering she isn’t a Stardom regular, but she defends the title pretty regularly. She won the title from Shanna on August 13th, 2017 and this is her third defense of the belt since then, with wins over Hiromi Mimura and Starlight Kid. 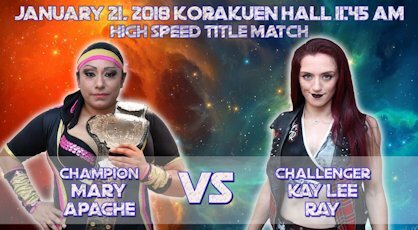 Kay Lee Ray is a semi-regular gaijin invader in Stardom and one of the best wrestlers in the world, so while the High Speed Championship is at best the fourth ranked title in Stardom, it should still be a quality match. They get right into it, as KLR springboards off the ropes, but Apache moves and knocks her to the mat. Camel Clutch by Apache, she picks up KLR and swings her around in the Gory Special but KLR gets away and rolls her up for two. KLR rolls Apache to the mat and kicks her in the chest, KLR elbows Apache but Apache elbows her back and they trade blows. Heel Kick by Apache, they trade elbows again until Apache slams KLR to the mat with a spinebuster. Mexican Surfboard by Apache but KLR spins out of it and applies a choke. Apache goes off the ropes but KLR trips her and slides out of the ring, she pulls Apache up on the apron but Apache knocks her down and puts KLR in a Surfboard while still on the apron. Apache picks up KLR but KLR superkicks her down to the floor, KLR gets a running start in the ring and sails out onto Apache with a tope suicida. Apache stands up but KLR dives out onto her again, KLR goes up top and dives onto Apache a third time with a cannonball. KLR slides Apache back into the ring, she goes off the ropes and dropkicks Apache in the chest for a two count. Gory Bomb by KLR, but Apache kicks out of the cover. KLR puts Apache in a submission, but Apache wiggles to the ropes and forces the break. KLR chops Apache and goes off the ropes, but Apache catches her with a sit-down powerbomb for two. Apache gets on the top turnbuckle and delivers a diving heel kick, Apache picks up KLR and drops her with a Michinoku Driver II for the three count! Mary Apache retains the championship. Mayu got injured at the worst possible time in her career, but she is now back and ready to take back her rightful place a the top of the promotion. Mayu was the World of Stardom Championship on September 24th, when in a title match against Toni Storm she seriously injured her arm. The match was stopped and Toni was awarded the belt, which I highly doubt was the planned result since Mayu had lost the Wonder of Stardom Championship the day before. This altered Stardom’s plans, but Mayu made a pretty quick recovery and here faces Rachael Ellering in her return/warm-up match. 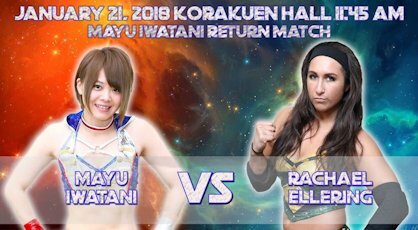 Rachael had a title shot against Io Shirai the week before, which she lost, and now looks to spoil Mayu’s grand return in her first match since her injury. They lock-up to start, Rachael pushes Mayu into the ropes and she gives a clean break. They trade shoves, wristlock by Rachael but Mayu rolls out of it and reverses the hold. Snapmare by Rachael and she puts Mayu in a headlock, Mayu elbows out of it and she delivers a dropkick. Elbows by Mayu and she dropkicks Rachael again, she goes off the ropes but Rachael boots Mayu in the face. Rachael stomps on Mayu’s still wrapped up arm, she pulls Mayu’s arm while it is in the ropes and continues to focus on it with kicks. Rachael picks up Mayu, superkick by Mayu and she dropkicks Rachael while she is against the ropes. Rachael falls out of the ring, Mayu goes up top and she dives out onto Rachael with a plancha suicida. Mayu slides Rachael back into the ring, she goes up top again and delivers a missile dropkick for a two count. Mayu picks up Rachael and goes for the dragon suplex, but Rachael blocks it and boots Mayu in the head. Spinebuster by Rachael, she charges Mayu and hits a jumping elbow. Another elbow by Rachael and she hits a scoop slam, slingshot leg drop out of the corner and Rachael covers Mayu for two. Rachael picks up Mayu but Mayu hits a crucifix slam, she charges Rachael but Rachael takes off her head with a lariat. Swinging Side Slam by Rachael, but Mayu barely kicks out. Rachael picks up Mayu but Mayu gets away and hits a German suplex, she goes up top and delivers the diving footstomp. Mayu kicks Rachael in the head, another high kick by Mayu and she nails her dragon suplex hold for the three count! Mayu Iwatani wins! This is a special main event from Stardom, with some serious implications for the promotion going forward. This is an Elimination Tag Team Gauntlet match, meaning that its in essence a series of singles matches between the two teams. Each pairing has a ten minute time limit, and wrestlers can be eliminated by pinfall, submission, or by going over the top rope to the floor. When a wrestler is eliminated, that team sends in their next wrestler, and the first team that runs out of wrestlers loses the match. To make it even more interesting, Kagetsu of Oedo Tai proposed the stipulation for this match – the last wrestler defeated in the match would have to leave their faction forever. An interesting match structure with an intriguing condition, and as both teams are popular with the crowd they are sure to be pumped up for the matches. 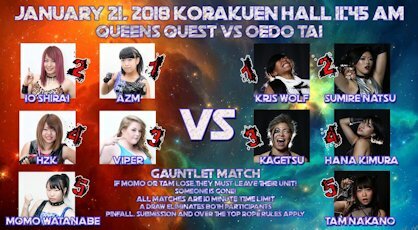 AZM vs. Kris Wolf – We start with the recently injured Kris against the youngest wrestler in the match, Kris charges AZM and hits a knee, but AZM rolls her up for the three count! Kris Wolf is eliminated and Queen’s Quest is up 5-4. AZM vs. Natsu Sumire – Natsu quickly runs into the match and starts beating on AZM, she put AZM in the ropes and all the members of Oedo Tai attack her. The cheating continues as the referee has already lost control, Natsu gets some water in her mouth and spits it down onto AZM. AZM slides behind Natsu and tries to throw her over the top rope to the floor, but Natsu lands on the apron. AZM tries to kick Natsu off but Natsu slides back into the ring and lariats AZM to the mat. Knees by Natsu but AZM fights back with an elbow as they trade blows, they both go off the ropes until Natsu boots AZM in the face for two. A Cutie Special gets a two count for Natsu as well, she picks up AZM but AZM cradles her for a two count. AZM charges Natsu but Natsu catches her and nails the Yoran (cradle DDT) for the three count! AZM is eliminated and the teams are tied 4-4. Natsu Sumire vs. Io Shirai – Hard elbow by Io, she goes after Natsu but Natsu grabs the top rope to get a break. Natsu wastes some time and lays down on the mat, Io covers her but Natsu quickly rolls up Io for two. Natsu goes for the Yoran but Io blocks it and applies an armtrap crossface, Natsu rolls out of it but Io knees her in the head. Io drags up Natsu and slams her on front of the corner, she goes for the moonsault but Natsu recovers and tries to push Io from the top to the floor, which would eliminate her. Io holds onto the top rope as Natsu tries to pry her fingers off, Natsu goes to charge at Io but Io skins the cat before Natsu reaches her. Dragon screw by Io and she puts Natsu in the Texas Cloverleaf. Natsu struggles for a quick moment but has to tap out! Natsu is eliminated and Queen’s Quest is up 4-3. Io Shirai vs. Kagetsu – They feel each other out and end up grappling on the mat, but neither gets a clear advantage. Irish whip by Io but Kagetsu shoulderblocks her down, she goes off the ropes but Io avoids her charge and does a backflip into a dropkick. Io goes to pick up Kagetsu but Kagetsu slams her into the corner, running elbow by Kagetsu and she hits a vertical suplex for two. Kagetsu picks up Io and goes off the ropes, but Io catches her with a hurricanrana for a two count. Kick attempts by Kagetsu but Io blocks them, palm strike by Io but Kagetsu blocks the double underhook facebuster. Io flips away from Kagetsu and hits a German suplex hold, but Kagetsu gets a shoulder up. Io goes for the Texas Cloverleaf but Kagetsu quickly gets to the ropes for the break, running double knee by Io in the corner and she hits the double underhook facebuster. Io goes up top but Tam Nakano hits her with a sign before she can jump off, Kagetsu then dropkicks Io off the top turnbuckle down onto the apron. Io gets up on the apron but Kagetsu dropkicks her as she tries to return to the ring, Kagetsu picks up Io while still in the ring but Io hits a palm strike. Tiger Feint Kick by Io while she is still on the apron, she goes to springboard back into the ring, but Kagetsu spits blue mist at her face. Kagetsu then slides out to the apron and chokeslams Io off the apron down onto the floor (and a mob of wrestlers), giving her the win! Io Shirai is eliminated and the match is tied 3-3. Kagetsu vs. Viper – Kagetsu immediately goes for the chokeslam but it doesn’t work, Viper throws Kagetsu into the corner but Kagetsu avoids her charge and applies a few flash pins for two counts. Viper returns the favor but also gets a two, kick by Kagetsu but Viper catches the next one and hits a backdrop suplex. Viper goes off the ropes but Kagetsu avoids the senton, she gets on the second turnbuckle but Viper catches her hurricanrana attempt and powerbombs Kagetsu to the mat for a two count. Natsu gets on the apron to distract the referee while the rest of Oedo Tai sneaks into the ring to attack Viper. It doesn’t help for long as Viper is quickly back in control, she goes off the ropes but Kagetsu spits water in her face. Kagetsu jumps up to the top turnbuckle but Viper runs into the ropes to send Kagetsu out onto the apron. Kagetsu tries to springboard back in the ring but Viper knocks her back to the apron, Kagetsu almost falls out but Oedo Tai catches her and pushes her back to safety. Viper also almost tumbles out but she catches herself, and both wrestlers end up safely back in the ring. Viper picks up Kagetsu but she gets away, running crossbody by Viper and she delivers the senton followed by a low crossbody for a two count cover. Viper picks up Kagetsu but Kagetsu gets away and kicks Viper in the head. Ebisu Drop by Kagetsu, but Viper gets a shoulder up on the cover. Kagetsu positions Viper and goes up top, but Viper avoids the Oedo Coaster. Viper picks up Kagetsu and headbutts her repeatedly, Viper Driver by Viper but the bell rings before she can make the cover, as time has expired. Both wrestlers are eliminated, and the match is tied at 2-2. Hana Kimura vs. HZK – Hana and HZK trade elbows as soon as the bell rings, HZK goes off the ropes but Hana catches her with a dropkick. Hana picks up HZK and they pull each other’s hair, Hana goes off the ropes and she pulls HZK down to the mat. Stomps by Hana and she knees HZK against the ropes before connecting with a running boot. Cover by Hana, but it gets a two. Hana picks up HZK and hits a delayed vertical suplex, she goes to the second turnbuckle but HZK recovers and hits a Codebreaker. Now HZK gets on the second turnbuckle and delivers the diving senton, HZK slams Hana to the mat and covers her for a two count. HZK charges Hana but Hana avoids the pump kick and pushes HZK onto the apron. Hana tries to boot HZK to the floor but HZK moves and she pulls Hana out onto the apron with her. Hana and HZK trade elbows on the apron, Hana goes for a suplex but HZK blocks it. Hana puts HZK on the second turnbuckle but HZK kicks her back and nails a sunset flip powerbomb down to the floor! Hana is hurt and both wrestlers are eliminated, as we are down to the last members of each team. Momo Watanabe vs. Tam Nakano – The loser of this pairing must leave their respective faction. After a stare down they trade strikes, snapmare by Tam and she kicks Momo in the back. Momo returns the favor, more kicks by Momo and she covers Tam for two. Momo kicks Tam into the corner and delivers a dropkick, she goes for a second one but Tam moves out of the way and hits a dropkick of her own. Irish whip by Tam and she hits the Space Rolling Elbow followed by a running cutter, kicks by Tam and she dropkicks Momo in the chest. Senton by Tam, and she covers Momo for a two count. Elbows by Tam but Momo dropkicks her, vertical suplex by Momo and she holds down Tam for two. Momo gets Tam on her back but Tam rolls out of the hold, high kicks by Tam and she finishes Momo with a spinning head kick. Another spinning kick by Tam, but Momo kicks out of the cover. Kicks to the chest by Tam, she goes for another high kick but Momo ducks this time and delivers two high kicks of her own. Somato by Momo, but when she goes for the cover, Tam reverses it into her own pin attempt for two. Momo picks up Tam and slaps her, she goes up to the second turnbuckle and nails the diving Somato for the three count! Queen’s Quest wins the match and Tam Nakano must leave Oedo Tai! One of the possible downsides of main events with ten wrestlers in it is it can make the rest of the card a bit stretched thin, but luckily that wasn’t the situation here. While the event started slow, really nothing from top to bottom was bad on the card, with all the matches having positive aspects to them. The last three matches all are worth going out of your way to see, with KLR making the High Speed Championship match memorable and Mayu Iwatani reminding everyone why she has been so sorely missed the last three months. The main event wasn’t flawless in execution but still had many memorable spots and a great sequence between Io and Kagetsu. 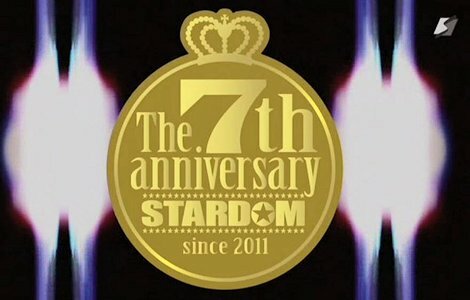 Overall, one of the better complete Stardom shows I have seen in awhile and an easy recommendation to watch.